Time does fly, and we should fly with it! And with the help of Hermitcraft Modsauce – our featured Mod Pack of the Month for May – we can! Hermitcraft Modsauce Modpack is the official Mod Pack of the Hermitcraft community in Minecraft version 1.7.10. This Mod Pack features a variety of mods focused on expanding the gameplay, extending the fun, and enhancing Minecraft as a whole by adding a lot of popular mods. As you probably know, Mod Packs are mostly separated and labeled by theme or some focused genre. This one, however, doesn’t have one. To put it simply, Hermitcraft Modsauce is a mosh pit of popular mods all jammed together to enhance Minecraft’s overall gameplay. Is this mod pack fun? Heck yes it is! Although this Mod Pack doesn’t focus on Tier-based technology mods (or any particular mod for that matter), it does feature a lot of technology-themed mods like EnderTech, Electrical Age, and GalactiCraft. However, unlike many Mod Packs, this one also features the content heavy Flan’s Mod Pack with almost all of its official Flan packs installed. That means giant mechanical titans, armed mechas, fighter planes, bombers, and tanks and artillery turrets. This spells chaos for most servers. Advanced technologies are also mixed with Medieval warfare with the Mine & Blade and Balkon’s Weapon Mods, so expect to find “sword vs. gun” and “horse vs. tank” scenarios in this awesome Mod Pack. Magic also exists in this Mod Pack with the addition of Witchery and Blood Magic mods. Those who seek the arcane arts will not fall short in the arms race. Exploration type mods like Biomes O’ Plenty are also included in the pack, along with those that encourages field and landmark exploration that adds underwater biomes, floating Islands, volcanoes, and improved villages – this is just a small sample of what you can find by exploring the Overworld. If you’re not into exploration, conquest, or magic, consider building your own fully-automated factory, or a hidden base full of deadly traps and defenses. Whatever you’re into, this Mod Pack has something for everyone. 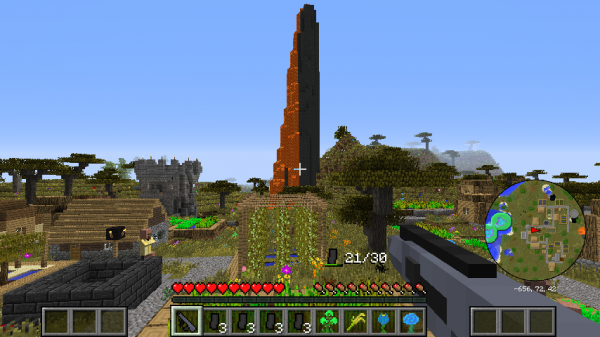 Of course, utility and client-help mods are also present to make your Minecraft life less of a hassle. These include Inventory tweaks, Damage indicators, the popular NEI (Not Enough Items), and a whole lot more. Most of these are optional. And even though this Mod Pack has the capacity and capability to generate another world war-level chaos, it also has the capacity to make one prosperous and complex nation on your server. Go ahead and try it with your friends! 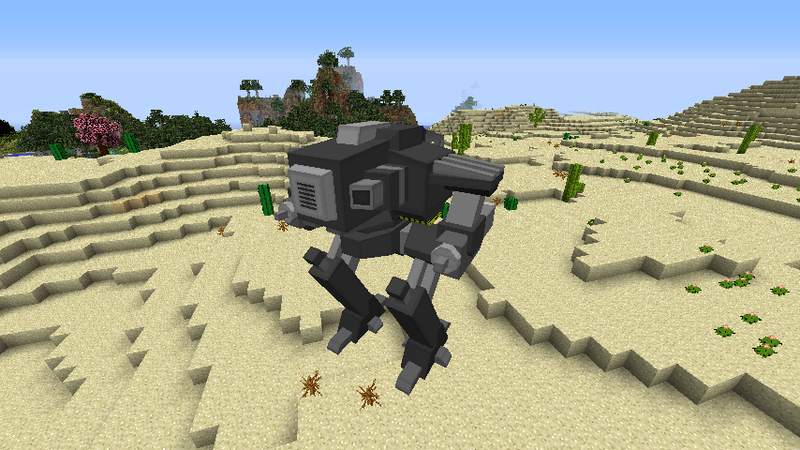 – Flan’s Mod + mech, modern warfare, titan, nerf, ww2 packs, and more. 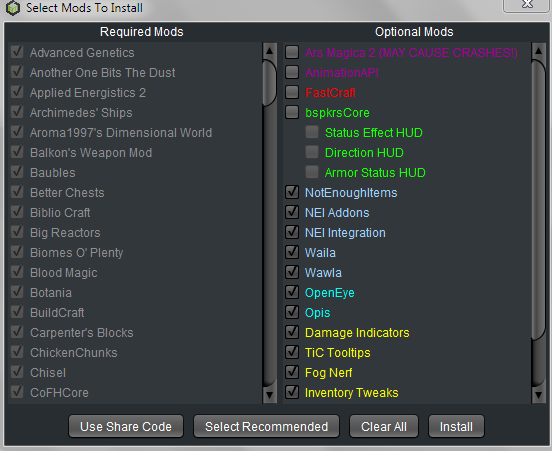 During the installation of the mod pack, you will be prompted with an option to install dozens of optional mods. Client-based mods don’t necessarily affect gameplay but it is important to remember that some servers may require certain optional mods in order for the client to join. Mismatched mods can create issues that keep you from getting approved to join a server. Which Optional Mods Will You Choose? Ars Magica 2 adds a wide range of magic derived from the natural elements. However, due to the number of mods already installed on the mod pack, installing another content-heavy mod might lead to server crashes. Do not install this without the Animation API. Animation API is a core mod that supports custom animation added by other mods. In this particular pack, the Animation API mod is needed by Ars Magica 2. FastCraft is a utility mod design to make Forge processing faster. This client-based mod is great for squeezing out a bit more FPS! BspkrsCore, StatusEffect HUD, Directional HUD, and ArmorStatus HUD are interface mods that add a convenient status display on your screen. The three latter mods need the BspkrsCore mod to be installed in order to work on a server. Not Enough Items (NEI) is a popular mod used for checking recipes or getting items or block that can’t be found in the creative inventory. WAILA (What Am I Looking At?) and WAWLA (What Are We Looking At?) are helpful mods that are used to identify items, blocks, or entities by just pointing the cursor on them – a really helpful addition in a very confusing world. OpenEye and Opis are Admin-related mods used to monitor the server for better management. Damage Indicators add a graphical HUD that will display the entity’s current health icon. This is a client-side mod. Inventory Tweaks add a button to instantly sort your inventory. There is also an auto hot-bar refill, auto armour equip, and many other tweaks. This is a must-have client-side mod. FogNerfis a mod created to reduce fog on certain occasions like being underwater or in lava. Voxelmap is a client side mini map. This mod requires the Liteloader optional mod to be installed as well. 1. Go to the download page on the ATLauncher official website. 2. Scroll down until you find the launcher that is compatible with your operating system and download the appropriate version. 3. Once you’ve downloaded the launcher, move it into a separate folder. Launch the file. The launcher will download the necessary library files and once this is complete the ATLauncher will open. 4. Press the second tab with the name “Packs” and find Hermitcraft Modsauce. 5. Press the “New Instance” button to create a client and download all the necessary files. 6. Choose what optional mods to install. Proceed with the installation to get your own Hermitcraft Modsauce Mod Pack client. EnviousHost is now hosting a trial server where we will feature the Mod Pack of the Month – Hermitcraft Modsauce – for the entire month of May. If you want to join this month’s MOTM, install The mod pack via ATLauncher and log in to our demo server here. Remember, at EnviousHost our goal is help you get the best gameplay possible, and each of our Minecraft Server Hosting packages are designed to do just that!